A request has been made via web team colleague, Bruce Wright, for the re-publication of the article below in response to a discussion taking place on this topic. This article was originally published in June 2010 during the FIFA World Cup. With the 19th FIFA World Cup upon us, here is a look at some players who have been selected for World Cup squads and have also played for Queen of the South. The mixed World Cup adventures of Jimmy Binning, George Hamilton and Ivor Broadis are already covered in the Queens Legends articles on each of those players. The features on Binning and Hamilton come with a health warning for Scotland fans as even now the maladministration by the team’s governing body of the day makes for a grimmer than grim cringefest. Sammy Malcolmson joined Queen of the South from Airdrie. A defender who liked getting forward, he played for QoS from August to October 1972 playing 13 games and scoring two goals. In the reign of Manager Jim Easton, his debut was a 4-0 defeat by Aberdeen at home in the League Cup. His last game was a 1-0 defeat away at Clydebank. He next played for Albion Rovers before emigrating to New Zealand where he played for Wellington Diamonds. He debuted for the New Zealand national side in 1976 and went on to gain fifteen full New Zealand caps and played in 17 other games for which full caps weren’t awarded. New Zealand’s first and only World Cup qualification prior to 2010 was in 1982. Malcolmson was selected and at 34 was the oldest member of the squad. Fate decreed that the first game for New Zealand at the ’82 finals in Spain would be against the native country of both Malcolmson and his team mate, Alan Boath. Despite a talent in the side in the young Wynton Rufer (Rufer later scored in the final when he won the European Cup Winners` Cup with Werder Bremen), New Zealand were widely viewed to be the group’s under dogs. Things were very much on track for the Scots at half time when they went in 3-0 up thanks to a Kenny Dalglish opener and a John Wark double. The complexion of the game changed in the second half with goals by two other migrants in the NZ side. England born Steve Sumner and Steve Wooddin each capitalised on sloppy defending to make it 3-2. Indeed the All Whites almost made it 3-3 soon after. However a goal from a John Robertson free kick and then a Steve Archibald header immediately after Malcolmson had been subbed made it a final score of 5-2 to Scotland. This was the only game Malcolmson played in at the finals. It did though have a significant effect on the destiny of the group. The free flowing football of the Brazil team gave them top spot from three straight wins. This included a truly terrific performance against the Scots after Dave Narey’s 20 yard opener (a superb strike that has gone down in folklore as being dismissed by pundit Jimmy Hill as ‘a toe poke’). Zico scored a beautiful free kick to make it 1-1 at half time. Brazil ran riot in the second half with some wonderful football, producing goals by Oscar, Éder & Falcão. The decisive game of the group was thus to be between the Scots and the USSR. The NZ goals against Scotland meant superior goal difference would be enough to take the Soviets through in the event of a draw. Joe Jordan took advantage of a defensive error to put the Scots ahead in the 15th minute. Aleksandr Chivadze’s scuffed shot was enough for an equaliser on the hour mark. Then came the game’s best remembered moment. Alan Hansen and Willie Miller clattered into each other giving Ramaz Shengelia (a Georgian, like Chivadze) a clear run in for a one on one with keeper Alan Rough. 2-1 to the Soviets with six minutes to go. Graeme Souness then scored to give a final score of a 2-2 draw still meaning an exit for the Scots. Had it not been the two goals scored by Malcolmson’s All Whites, Scotland would have progressed instead of the Soviets. The game against Scotland was Malcolmson’s last for New Zealand. The next destination Cloy refers to was, again like Sammy Malcolmson, Albion Rovers. Slaven found the net with regularity over the season and a half after his short spell at Palmerston. As well as 27 goals in 42 Rovers league games he scored 31 goals in season 1984/85, winning a case of champagne as the prize for winning the Daily Record Golden Boot competition. He then worked briefly as a gardener before leaving for Middlesbrough after having made it clear to Rovers that he was determined to move on. At Boro things got better again as he was the Teessiders top scorer in six straight seasons. In 1988/89 only Alan Smith and John Aldridge scored more top division goals in England than Slaven’s composed finishing. His 146 Boro career goals earned him near prophet status among supporters and a nickname of ‘The Wolfman’. Despite being born in Paisley he also qualified to play for the Republic of Ireland due to his Irish grandfather. In seven full internationals for the Republic between 1990 and 1993, Bernie Slaven scored once. He earned selection by Jack Charlton for the Irish squad for Italia 90. At the finals Slaven didn’t play in any games. From the bench he watched the last 16 penalty shoot out against Romania (David O’Leary’s clinching spot kick is an iconic moment in Irish international football history). Slaven later admitted in his autobiography that he was non-plussed and looking forward to returning home to Middlesbrough so he could spend time with his much missed dogs. It is thus with a tiny hint of irony the fate that befell Slaven’s team mates in the last eight. A single goal by Italy`s Salvatore Schillaci, widely known to his friends as ‘Toto’, meant a flight home for The Wolfman and his canine friends to slobber affection on each other. 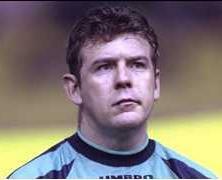 Andy Goram, then of Oldham Athletic, was first selected for a Scotland squad for the World Cup finals in 1986. Selected in 1990 when at Hibs, as per in 1986 Goram didn’t feature in any games. It was immediately after Italia 90 when Goram took over as Scotland number 1 from Jim Leighton. By the time of the Euro 92 finals in Sweden Goram was well established. He earned a reputation as one of the best reflex keepers around with his remarkable ability to pull off miracle saves and again wore the keeper’s jersey for the Euro 96 finals in England. Goram then retired from international football when part of Craig Brown’s training camp 15 days before Scotland were scheduled to play in the France 98 opening game against Brazil. Thus it is slightly surprising when considering Goram was selected for three different World Cup squads over 12 years, he never played in a game at the World Cup finals in his 43 Scotland appearances. He did though continue with his domestic career and was signed for Queens by John Connolly in season 2002/03. It was with Queens that he added further to the achievements in his career in that season’s Challenge Cup. From playing in the final 2-0 win against Brechin City at Broadwood, Goram became the first player to earn a set of all four medals from Scottish football’s domestic competitions. Goram was also a dual international, having represented Scotland at cricket as well as football. Marvin Andrews joined Queen of the South midway through season 2009/2010, earning a contract from Manager Gordon Chisholm after playing in a couple of games as a trialist. The big centre back’s international career with Trinidad and Tobago is considerable – he collected 101 full caps. He was selected for his country’s squad for the 2006 World Cup in Germany. However he picked up a training ground injury prior to his side’s first game against Sweden and lost his place in the starting eleven. Brent Sancho took Andrew’s place beside Dennis Lawrence. Thus the only major Finals that Andrews played in was the 2005 CONCACAF Gold Cup. Andrews played in the 1-1 draw against Honduras and then scored the opener in the 2-2 draw against Panama. Andrews and his team mates were then eliminated after their final group game, a 2-0 defeat by Columbia. The tournament was ultimately won by host nation USA. Many thanks to Bruce Wright for contributing to this article. Click here for Dougie McBain and the 1948 Olympics. Click here for Ally MacLeod.